Powerful and written in a solid voice, Pavel Brycz’s “I, City” is a book told from the perspective of the city itself. The book’s narrator is actually the city of Most in the Czech Republic; having watched its inhabitants through omnipresent eyes, the city tells us stories, gives us short glimpses into the lives of the dwellers of Most. While in many ways, the stories of the people could happen in any city, in Most the inhabitants are met with their own challenges – the challenges that occur while living in a city in decline. But the city seems sympathetic towards those who dwell within her walls, somewhat proud of their strength and resilience. We get to hover over the streets, sneak into the buildings, listen in on conversations, and thus get to know Most. Each chapter is an appearance of new characters, offering the opportunity to observe a scene of life, which leaves one with the sensation of walking through a city invisible. Pavel Brycz understands how to say much with few words, giving a resonating power to each short chapter which presents a series of stunning impressions on the reader. Beautifully translated, the book flows effortlessly in English. 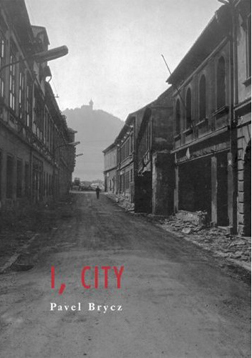 Originally written in Czech, “I, City” is the first of Pavel Brycz’s books to be translated into English. Published by Twisted Spoon Press of Prague, Czech Republic, the book was translated by Joshua Cohen and Marketa Hofmeisterova. I have a copy of “I, City” sent to me straight from Prague to give to one carp(e) libris reviews reader. The winner of this book is guaranteed a unique and beautiful book, not only in writing style but in its physical appearance as well. Ready to enter? 1.) Just leave a comment telling me something your city or town might say about you if it were to tell your story. (You may enter once a day – following entries don’t require you to answer the question.) Remember, leave an interesting comment. If I cannot contact the winner, you might be chosen instead based on your comment. Feel free to do all four, plus enter once a day, and you can gain up to 10 entries to win! You have until midnight EST on Friday, January 2, 2009, to enter. Oh, yes I’m a subscriber too! My city would say that I’m Ukrainian-American, became well-known for very imagistic poetry, did a TV program on cable for 12 years to facilitate the voices of artists of all genres in the media (for very little pay instead of doing quilting shows or how-to shows for lots of money), am doing collages now, and love my inherited German Shepherd – Husky mix Birdie, two rescued cats and a number of parrots who are real characters! My city will brag how watchful I am of my neighbors, especially my elderly neighbor next door. I’m family-oriented, devoted Christian, involved parent in my children sports and like to keep my property looking nice. juicebox moms last blog post..Early Christmas Gift for me! My city might say I spent way too much time at Walmart. I really want to win this book. Anyway I was reading Ender’s Game the book again and I realized that we will all be dead in the next hundred years. If you look at a museum the artifacts belonged to someone that thought that they were invinsable. Man this got me to think that we all need to live our life. So next time i do something wrong I will be happy about it. I know I’m rambling and sound like I am a goth but celebrate life people!! My city would say: don’t you ever take a vacation? It’s about time. I’m just here to enter again (for the once daily entry). My city (Toronto) might say I am so like her….self-absorbed….civilized….passionate on the inside…boastful…wanting to be liked…needing of approval…mindful of others opinions…civilized…polite….warm and chilly at the same time…!! The city of Los Angeles is a story unto it’s self just like me! The wildness of the city yet the calmness of breathing……those loving life and the down and out…..and always the sky wide open. And, what would my city say about me? The universe is a’dazzle with wonder! And, I TWITTERED about this fabulous give~away…….user name: leahita. My city, I hope, would remember me as someone who did a lot of local shopping and took an active role in local government. My city would probably said it is very hot and humid in the summer. I am interested in this book because some of my family history is Czeck. My city would say I keep to myself. Guess that’s because my nose is behind a book. Appreciate your giveaway offer. That’s a hard question to answer. It would say I’m a multi-faceted mystery. My city would say that I would love to get my small business going so I help others during this economic crisis. My city would say that I host great parties. Paiges last blog post..Welcome, 2009! Interesting question. I currently live in Birmingham, AL and I have lived her for 15+ years. This city has transformed me as a person with its interesting historical context, continuing racial tensions, and intriguing blend of political viewpoints. As a result of living here, I am now more outspoken about my opinions, more liberal than ever before, and I believe strongly in the power of diversity and open-mindedness. This city would have a lot to say! Thanks for the giveaway. I promoted your giveaway on Luck Happens: http://www.luck-happens.com/january-2.html. I am an ex-pat from Canada. Given our new president here, my city would probably be embarassed for all the jibes I’ve taken regarding moving to an ‘intolerant’ society! What an interesting sounding book! I’m in!! I’m new to my current city. It would probably say……..OH NO! Another crazy Army wife!!!! Jeannies last blog post..People email me the weirdest stuff! I’d like to enter again today, please. It is the last day to enter. I hope I am fortunate enough to win. Thank you for supporting all the local businesses and not so much the chains. My city might say about me that I’m very shy and quiet. I do not know what my city would say, for I have not lived here very long. I would think it would say “I do not know you- but I would like to.” Thank you.